Born and raised in the rural South, Karen Strong spent most of her childhood wandering the woods, meadows, and gardens of her grandmother’s land. 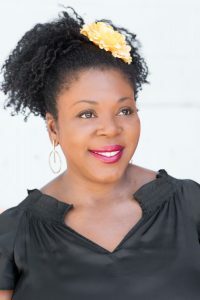 A graduate of the University of Georgia, she is an advocate of Science, Technology, Engineering, and Math (STEM) and worked in the software development industry for several years as a systems engineer, business analyst, and technical writer. A reformed night owl, she now spends her early mornings writing fiction. An avid lover of strong coffee, yellow flowers, and night skies, Karen currently lives in Atlanta. 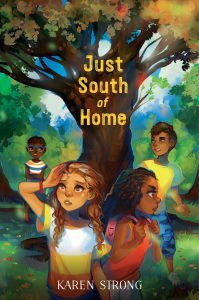 Just South of Home is her debut novel. Karen has been an online buddy and science geek sister for a long time now; I’m thrilled to welcome her to The Brown Bookshelf! When I was growing up, I didn’t know that you could make a living as an author. My mama would take me to the public library every Saturday and we would stay until it closed. Throughout those years, I didn’t see many stories featuring Black girls and I didn’t see many Black authors either. Due to my accelerated reading level, I delved deeper into horror, science, and non-fiction books. I do have early memories of writing as a kid, a strange mix of stories due to the influence of my maternal grandmother’s love for The Young and the Restless and the magical journeys in the woods on my paternal grandmother’s land. In high school, I wrote stories for my friends but still didn’t think becoming an author was an option. I was on the newspaper staff so I thought about becoming a journalist. I was also a computer nerd. Technology fascinated me and I also found I was very good at it. So I decided to put aside my writing aspirations and pursue a career in software development. Growing up in the rural South, I had been raised with the notion that having a good education in a “high-paying” field could propel you from the working class into the middle class. Being creative and chasing artistic dreams was always low on the priority list because it didn’t pay the bills and provide for your family. After getting financial security from my tech career, I tried to pursue writing again. I briefly had a writer mentor and joined a critique group where I learned valuable skills. I even enrolled in a graduate writing program but eventually dropped out. Life always seemed to intervene and there were several years where I didn’t write anything at all. Eventually in 2006, I started on my path to writing again. I read a lot of craft books and novels and I started to find my voice. This is when I fell back in love with words. I knew that it wasn’t too late to chase my dream of becoming a published author. During these years, I taught myself how to write. Writing toward traditional publication is not easy. In fact, it’s extremely difficult for Black writers because of the historical roadblocks and underrepresentation in the publishing industry. For me, it was a combination of timing and luck. In early 2016, I had decided to return to middle-grade fiction (which is my first love) and was revising a novel. This is when I first heard about #DVpit, a Twitter pitch contest that spotlights marginalized writers founded by agent Beth Phelan. I decided that I would participate because I would have a polished manuscript and query letter done before the April event. My pitch was successful and I received several agent offers within a month. Eventually Simon & Schuster bought my manuscript. All of this happened within a short span of a year after a decade of writing and honing my craft. So I guess you could say my publication journey was sparked by a tweet. My inspiration when it comes to storytelling is the rural South. My experience of growing up in this world has left an indelible imprint on me. I think of all the Black men and women who helped raised me and loved me. I think of our ancestors who were brought here and despite the horrific circumstances made a home for themselves. I see their resilience and ingenuity and know that these qualities also run through my veins. I think it’s the reason I will always write about the South in some capacity. We need more than a single story when it comes to the Black people who were born and still live here. The South is where my heart belongs and it is a place with its own special magic. There are so many Black authors today that inspire me. Especially the authors who have been published since 2010. Things are getting better. Traditional publishers are getting Black authors out on the bookshelves. But we still need to continue to find more new voices. My hope is that the traditional publishing industry doesn’t rest on their laurels with the current progress. I want us all to keep striving to discover new voices. There are many aspiring Black authors who are talented and have stories that need to be told. About Just South of Home (from the publisher): “Cousins Sarah and Janie unearth a tragic event in their small Southern town’s history in this witty middle grade debut novel that’s perfect for fans of Stella by Starlight, The Ghosts of Tupelo Landing, and As Brave as You. Twelve-year-old Sarah is finally in charge. At last, she can spend her summer months reading her favorite science books and bossing around her younger brother, Ellis, instead of being worked to the bone by their overly strict grandmother, Mrs. Greene. But when their cousin, Janie arrives for a visit, Sarah’s plans are completely squashed. You can find Karen Strong on Twitter, Instagram, and at her online home. Viewpoints of the rural South in MG has had a narrative long dominated by other voiew, and I’m excited to hear this one. Also LOVE the mystery aspect! Excited to read this.